Over the next month Crafty Fox Market will be showcasing over 250 carefully curated UK Designer Makers in a series of Christmas markets in London. Helping to select stall holders from a pool of over 550 applications were Kate Burt, Supermarket Sarah and Emy Gray. In this blog we caught up with Kate Burt, interiors journalist and blogger (Your home is Lovely) to talk about curating, her love of markets and who’s on her shopping list. What do you love most about shopping at markets? The adventure! You never know what treasures might be on that next stall - and I love the friendly element too, you can't buy something from a market without a proper chat with the person you're buying from, and when they have also made the thing you're buying, that's all the better as you get a proper connection and history with your purchase when you get it home. What was the best thing about helping curate the Crafty Fox Christmas Markets? The power! Hahaha. I joke, but there is something thrilling about being in the company of two other curators - and the ever-tasteful Sinead - to create your own retail vision for a few days. It's like the best window shopping experience ever! There were so many applicants! It was a long night, with lots of difficult decisions based on all sorts of factors, many of which were new to me. Which stalls are you most looking forward to checking out at the markets? Kinska, at Brixton, who creates ceramics featuring odd faces and characters – I love that she has a sculpture called 'Weirdo'. 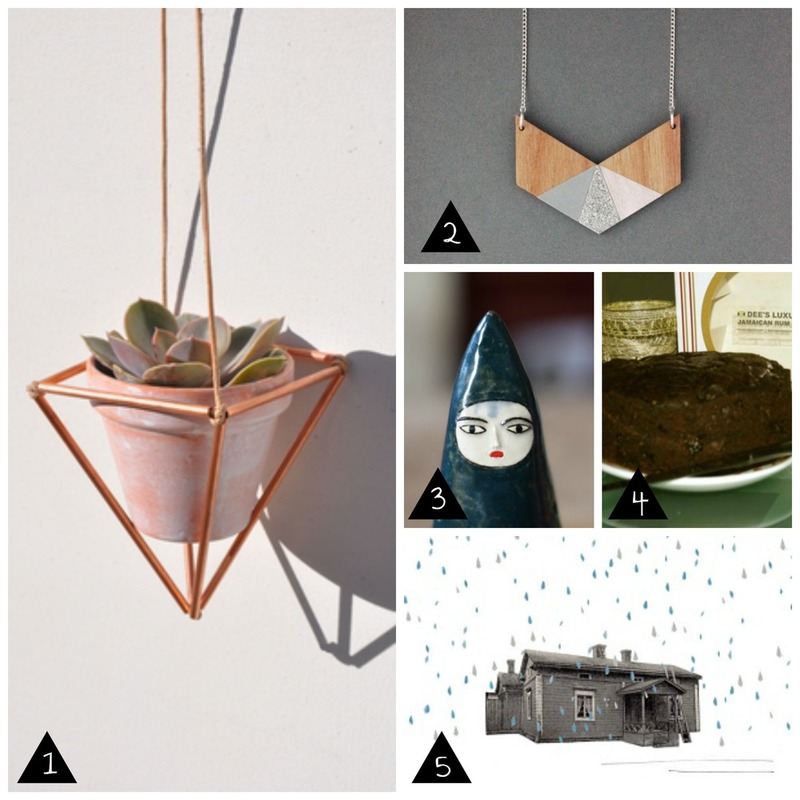 I also have my eye on some Fawn & Rose geometric jewellery (Brixton), Lucy Driscoll's quirky photographic cards (Dalston) are very cool, as are Pikku Potin's unusual metal plant hangers. And, for shopping sustanence, Dee's Luxury Jamaican rum cakes, at Brixton. What types of products would you like to see more of at Crafty Fox Markets? I would love to see more of the stuff that's useful as well as decorative (and I count cushions as useful). I'm also very drawn to (often completely un-useful) oddities, so always good to see other people's unusual imaginations at work. Any tips for someone thinking about applying to a future market? Make really good quality stuff! Some of the ideas we saw were really clever and interesting, but if the finishing details aren't tip-top, it's a risk. And also look at what's out there: be bold, make something unique and stand out. Finally, make sure your photos do your products justice because it's all a guest curator has to go on.